Urinals in Amsterdam with flies etched in the bowls-Truth! - Truth or Fiction? Urinals in Amsterdam with flies etched in the bowls-Truth! 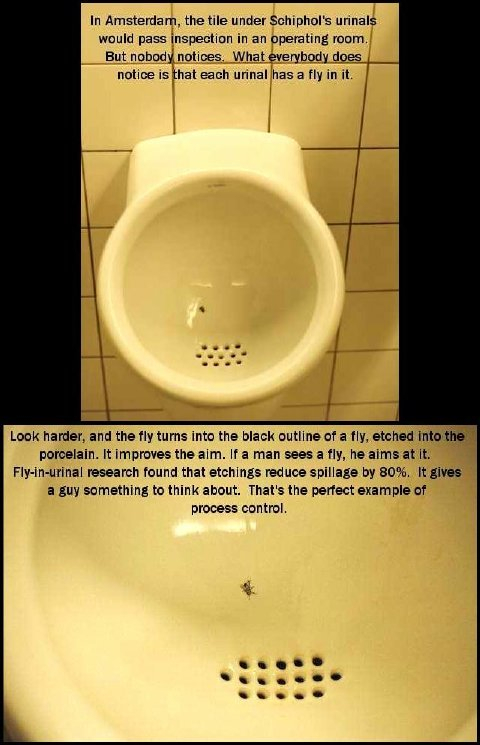 Urinals in the Airport in Amsterdam With a Fly Etched Into the Bowl-Truth! Pictures of a urinal that says they are in the airport in Amsterdam. There is what appears to be a house fly in the bowl of the urinal. The eRumor says the fly is there on purpose and has reduced spillage by 80 percent. The pictures are authentic and the story is accurate. The actual pictures are from an unique site at www.urinal.net. The United Nations and the Internet-Truth! Cell Phone Numbers Are Going Public in a National Directory-Fiction!